A Peruvians-only tren local receives passengers at Ollantaytambo on Oct. 6. All photos by Malcolm Kenton. The least expensive and most basic service on Peru’s only narrow-gauge line is available on four daily PeruRail trains that only Peruvians are allowed to ride (a Peruvian national ID card is required to purchase a ticket). The fare for any length of journey on these “local trains” is 10 soles (about $3.50 US). One train goes all the way from San Pedro station in central Cusco (from whence the tourist trains once departed) to Aguas Calientes, while three others go between Aguas Calientes and the Sacred Valley town of Ollantaytambo, all making other intermediate stops that the tourist trains bypass. These are offered as a social service to provide basic transportation to those living and working along a line that is mostly not paralleled by roads. The top-of-the-line service is offered on the Belmond Hiram Bingham, a luxury train named for the American expeditionist who ‘discovered' the remains of the Incan city in the 1910s. The price tag of $512 for a one-way trip dissuaded me from adding it to my itinerary, but a round-trip on the Bingham is inclusive of tickets to enter the Machu Picchu site and ride the bus between it and Aguas Calientes, as well as sumptuous meals and unlimited drinks on board and afternoon tea time at the Belmond Sanctuary Lodge just outside the site’s entrance gate. Interior of a PeruRail Vistadome train at Poroy on Oct. 3. 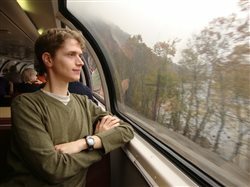 In between the tren local and the Bingham lie two classes of tourist service offered by PeruRail, Expedition and Vistadome, and three by Inca Rail (in descending order of price and level of service): Presidential, First and Executive Classes. Only Executive is offered all the way between Poroy and Machu Picchu, while the other two are only offered between Machu Picchu and Ollantaytambo. For the busy tourist market, both operators practice variable pricing based on demand, like Amtrak and the airlines. On my Friday outing, I rode PeruRail’s Expedition service from Poroy to the lone intermediate stop at Ollantaytambo, a small, picturesque, touristy village surrounded by high mountains. After a small ticketing fiasco of which I’ll spare you the details (suffice it to say that PeruRail doesn’t technically sell a tourist ticket from Poroy to Ollantaytambo) and a pleasant walk around the town during a two-hour layover, I continued my ride to the Machu Picchu station in Aguas Calientes on a Vistadome train. Interior of a PeruRail Expedition train at Poroy on Oct. 6. 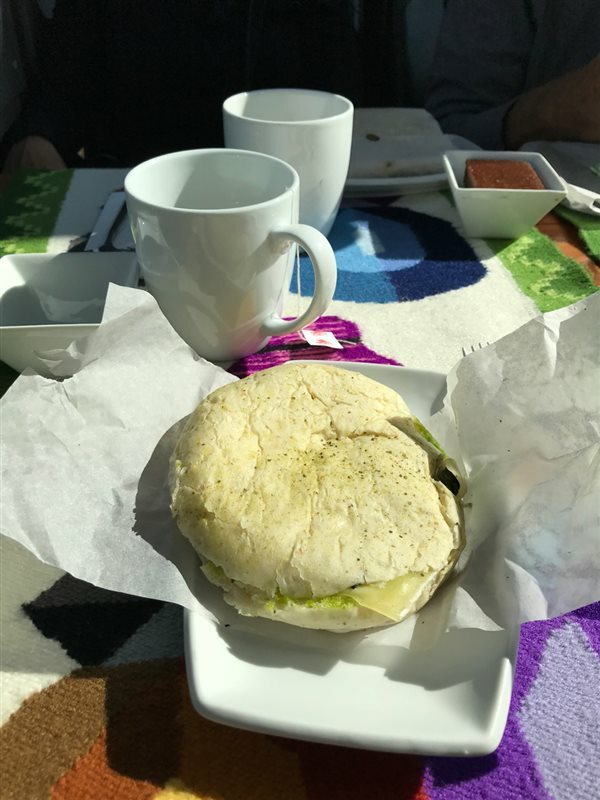 The food and beverage service in Expedition class is very basic: a bag of Inca Corn (crispy, crunchy large grains of corn), a cookie or chips, and a beverage (coffee, tea, juice, purified water, Coca-Cola or Inka Cola, a bright yellow-colored Peruvian soft drink that tastes a bit like Sprite). In Vistadome class (whose ambiance and seating is only slightly nicer than Expedition, and which generally costs only $15 to $20 more), the same beverages are offered complementary, but you are also served a hot sandwich (spinach, egg and cheese with pesto in the morning and grilled vegetables with cheese in the afternoon and evening) and have the opportunity to purchase alcoholic beverages, premium bottled water, and an assortment of local edibles, including various products made with coca leaves. 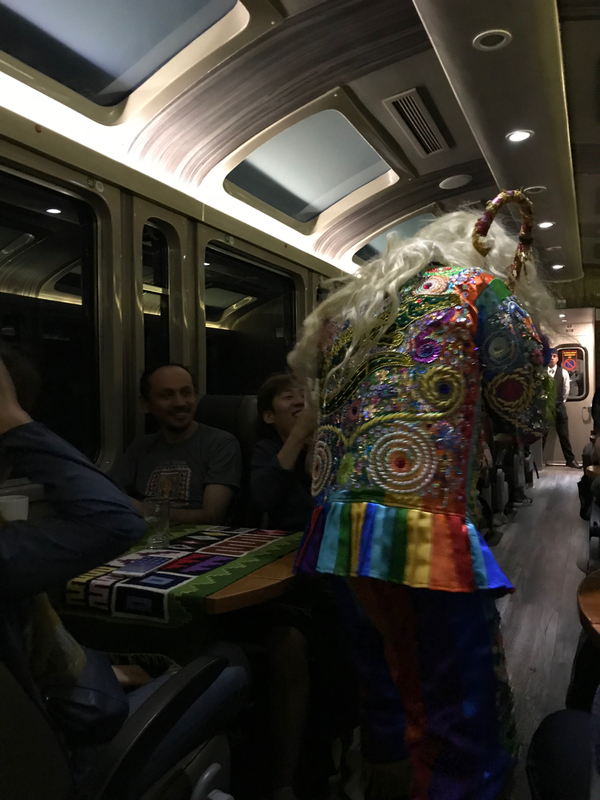 On the evening return trains to Poroy, there is also an on-board fashion show of Peru’s signature baby alpaca clothing (unique garments can only be purchased on board) and other souvenirs are offered for sale, while one crew member dresses up as a colorful Andean diablo and performs a dance up and down the aisle. I had experienced the return trip in Vistadome on Tuesday (Oct. 3) with the Trains tour group, but upon Friday’s arrival at Machu Picchu station, instead of going back up to the heritage site, I took PeruRail’s Expedition round-trip to Hydroelectric station, located at the end of the line 6.7 miles past Aguas Calientes in a small community deep in the jungle near a major hydroelectric dam that is not visible from near the station. My itinerary left me a half hour to walk around the station area before returning. The train was three cars long, but all passengers were ticketed in the middle car and were seated bunched together, but were allowed to spread out once the train departed. Hikers and backpackers, mostly from the US, Canada and Europe, made up most of this train’s clientele and were seen along the trails paralleling the track the whole way. Interior of an Inca Rail Executive Class car on Oct. 6 at Machu Picchu station. 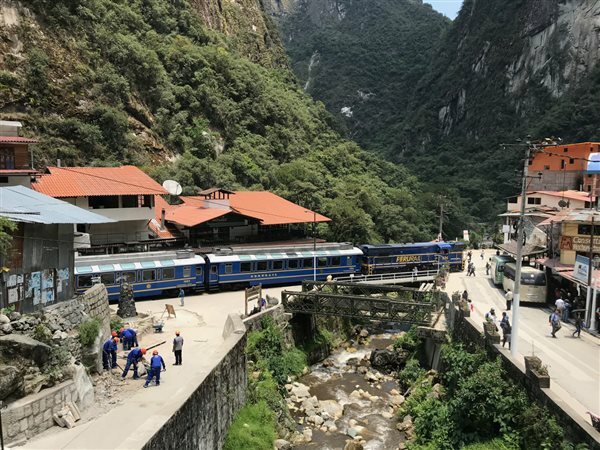 Upon arriving back at Machu Picchu station, I had just enough time to connect for my return ride to Poroy on Inca Rail in Executive Class (the middle car of a five-car DMU train). Inca Rail’s on-board service and entertainment is not as lavish as PeruRail’s, and the train seemed a bit more cramped. The ride quality was also worse. Quite a bit of rocking back and forth, though the noise of the overhead engine was well muffled. 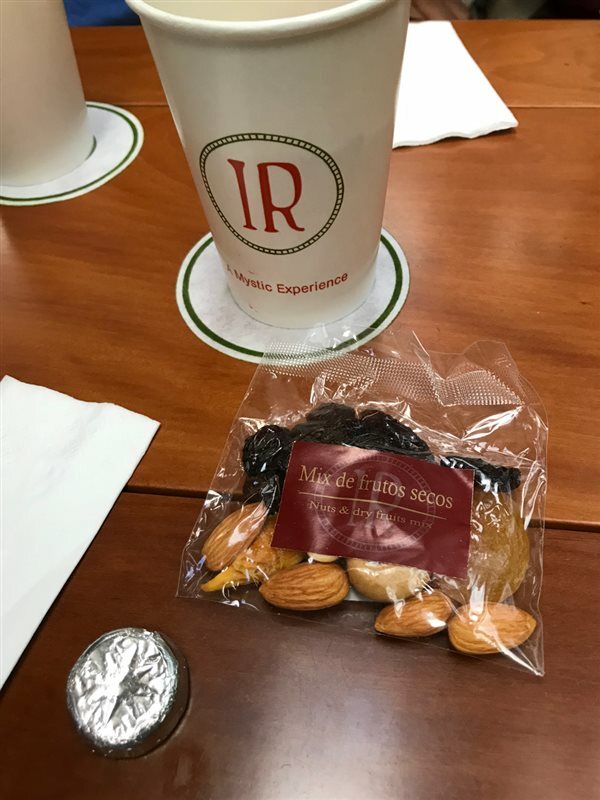 Passengers are served one of a similar selection of beverages along with a bag of mixed nuts and dried fruits during the first half of the trip, and a bag of three savory cookies and one sweet cookie with another round of beverages during the second half. The fare I paid for the one-way IncaRail trip was $20 more than the same trip would have been in PeruRail’s Vistadome, but I found the latter to be a more comfortable ride and a greater value. A view in the Sacred Valley from an Inca Rail train on Oct. 6. 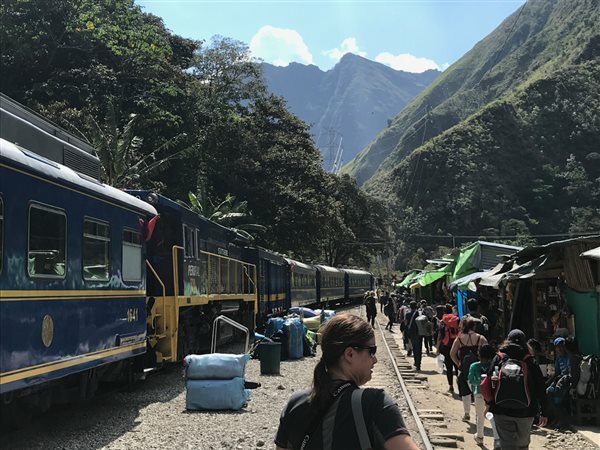 The three hour and 20 minute ride between Poroy and Machu Picchu station, along with a visit to the famed world heritage site, should be on the bucket list of every avid traveler and passenger train aficionado. It is likely that the demand from visitors from around the globe will sustain a similar level of service and very high per-passenger-mile revenue on this meter-gauge line for decades to come. 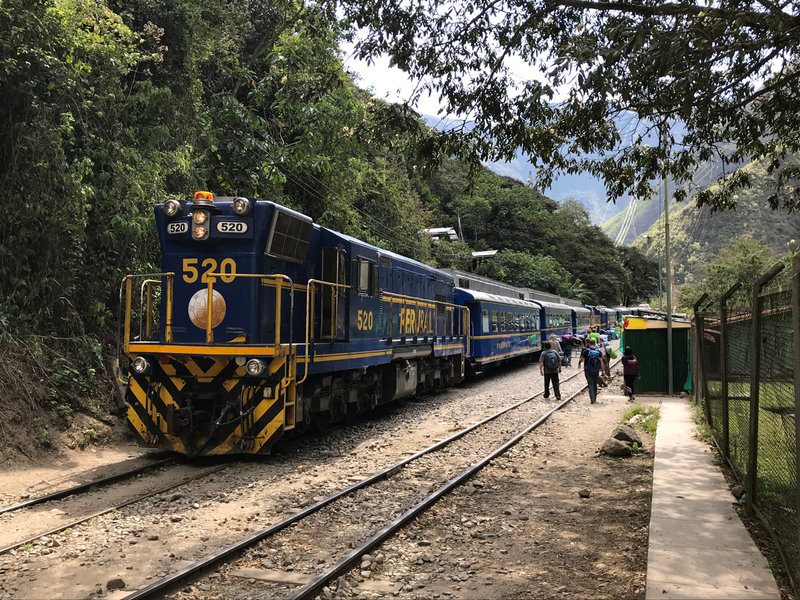 While both competing train operators offer a reputable service with similar amenities, for slightly better bang for one’s buck, I would have to give the nod to PeruRail over Inca Rail. But however you go, a great adventure awaits. Two PeruRail consists, an Expedition train (near) and a tren local, at Hydroelectric station on Oct. 6. Alco no. 520 leads the Expedition consist laying over at Hydroelectric station. The vegetarian breakfast sandwich served on board a morning PeruRail Vistadome departure. The Andean dance performance on the evening PeruRail Vistadome train. The snack and chocolate offered on board Inca Rail's Executive class. 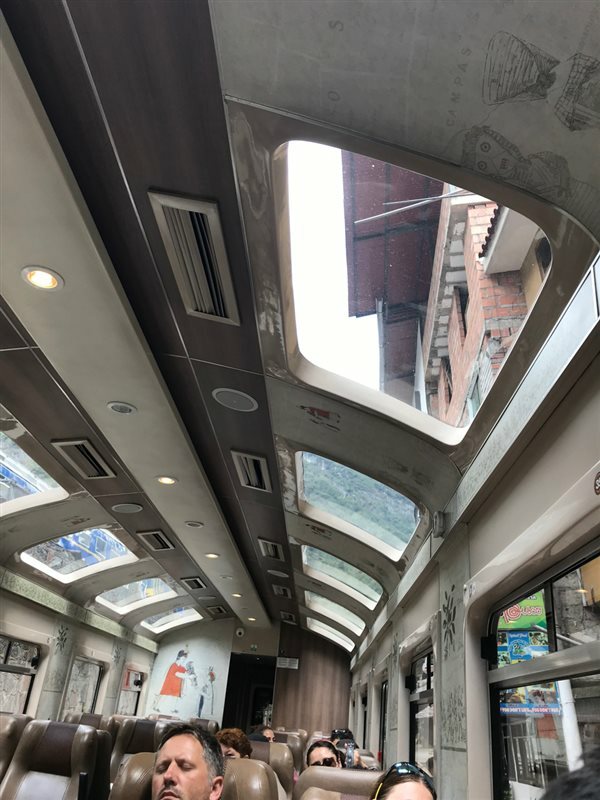 Interior of the Expedition train while boarding along Avenue of the Incas in Aguas Calientes. PeruRail Expedition train traveling through the middle of Aguas Calientes, the touristy village at the base of Machu Picchu, along Avenue of the Incas.